Give your typical soldier an atypical method of problem-solving and open yourself up to a wider and more appreciative Audience. Premiering at the 2017 Sundance Film Festival, Alexandre Moors’ adaptation of the novel The Yellow Birds by Kevin Powers offers a deeply-involving account of the war in Iraq. Highlighted by a compelling star performance by Alden Ehrenreich and enriched by Toni Collette, Tye Sheridan, Jack Huston and yes—even, Jennifer Anniston—the film engages both heart and mind; a difficult task given the genre’s usual offerings. The primary reason for the film’s success lies in the solid narrative structure beneath it all. The filmmakers address all Four Throughlines with diligence and subtle sophistication, allowing the Audience to leave feeling both satisfied and emotionally fulfilled. 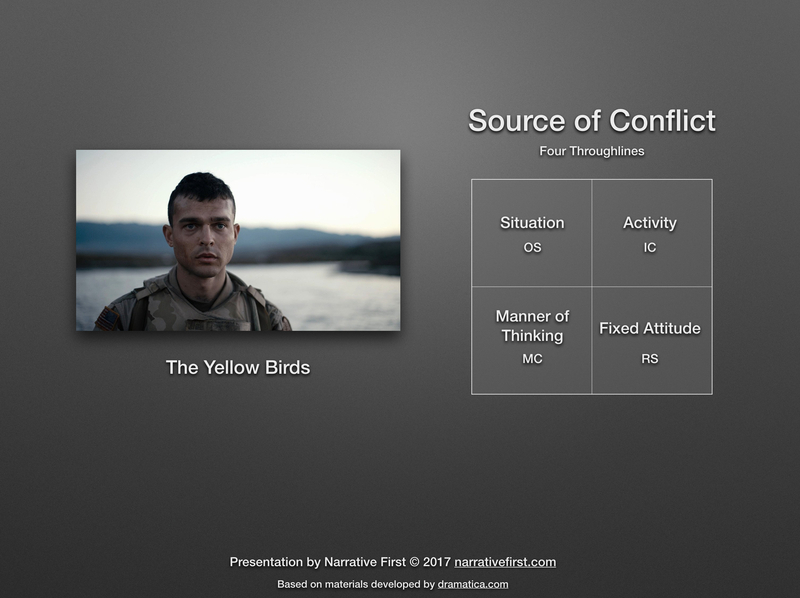 About halfway through the film, I started to notice a similarity between The Yellow Birds and Platoon. I couldn’t quite put my finger on why, but I knew that there was something that just felt the same about the two films. It wasn’t until I started the analysis the next day that I finally realized the source of my tingling story sense. This is a great synopsis of three of the four Throughlines. Bartle (Ehrenreich) is the Main Character enraptured in a personal struggle to figure out what his life is all about. Murph’s mother Maureen (Anniston) is the Influence Character struggling to understand what happened to her son. And the relationship between the two of them—this unspoken promise by Bartle to be the first to tell Maureen in case of any tragedy—bonds them together into the Relationship Story Throughline. The fourth Throughline—the Overall Story Throughline—isn’t apparent from the synopsis but is from my brief explanation above. Murphy disappears and no one knows what happened to him…at least, that is the story being told. Arranging these Four Throughlines into the Dramatica Table of Story Elements by taking into account the source of conflict in each, we discover a familiar arrangement. 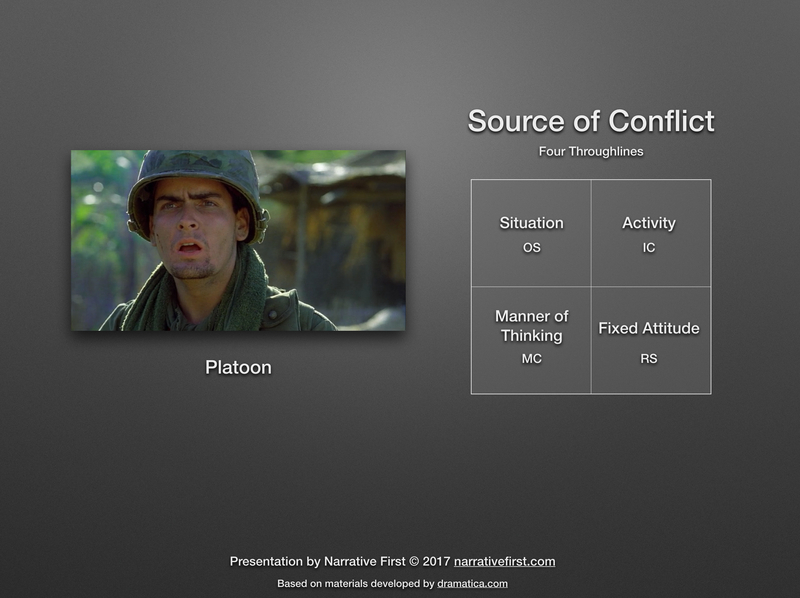 Platoon and The Yellow Birds explore the same kind of conflict in each of their four Throughlines. Everyone finds themselves stuck with a Situation, whether it be Vietnam in Platoon or the missing Murphy in The Yellow Birds. Both Main Characters struggle with Manners of Thinking while being challenged by Influence Characters who create conflict through their Activities; Barnes’ violence and Maureen’s investigation impact the psychological concerns of both Taylor and Bartle respectively.1 And finally, the central Relationships in both films find common conflict in Fixed Attitudes. While the films begin to differ as we move deeper into the thematics, it is this arrangement of Throughlines that breeds the most familiarity. Well, that and the way the Main Characters in both films solve problems. Intrigue struck at Sundance once the house lights returned. Instead of the disdain and smirks that typically accompany the disappointed faces of female Audience members after a war movie, there was contemplation, reflection, and empathy. I thought the film was OK, but the women around me loved it. Even my girlfriend—who avoids war films at any cost—thought the film was fantastic. And that’s when it hit me why the film felt so much like Platoon. Like Oliver Stone’s masterpiece, The Yellow Birds is structurally a chick-flick. As covered in great detail within our article Predicting Who Will Listen to Your Story, the combination of the Main Character’s Problem-Solving Style and the Story Limit placed on the Overall Story Throughline determines the level of empathy by gender. By “get” we refer to the level of empathy and base instinctual understanding. Clearly, both men and women understand the difference between Linear and Holistic and the difference between Options and Time; the last thing we need is yet another overreaction to assumed sexism. Yet there is a tendency for male audience members to gravitate towards Linear/Timelock stories and for female audience members to gravitate towards Holistic/Optionlock stories. The Yellow Birds will be better received by female audiences than say something like Blackhawk Down or Kilo Two Bravo because of this dynamic of a Main Character who problem-solves holistically inside of a story limited by options. Female audience members relate to Bartle and how he goes about resolving issues moreso than the men in the audience. Bartle feels different than other war “heroes” because he works to hold everything together, instead of trying to pull it all together. When asked by his girlfriend to come live with her in his dorm, he simply responds Ok, I’ll start packing now. No concern over the steps in-between or the requirements needed to successfully join her. In fact, if he were more Linear in his problem-solving, Bartle probably could have found a way to get his life together without enlisting. Contrast Bartle’s almost nurturing nature towards Murph with the stark cause and effect drive of Sergeant Sterling (John Huston). In fact, when Bartle finds himself with a clear case of cause and effect (If I had shot that guy in the window, then the guy next to me would not be bleeding out.) he seems shocked, almost as if he doesn’t understand what happened. The preference for one type of problem-solving creates a blind spot towards the other. The scene with the missed shot showcases Bartle’s blind spot towards linear problem-solving. Bartle’s Main Character Issue lies in an essence (State of Being) that is unfit for this war and this world. By Thinking of that place where the horizon meets the sky he resolves his initial angst and finds peace in his incarceration (Story Judgment of Good). The Yellow Birds shines as a perfect example of taking the familiar and overwrought and elevating it to something truly unique and compelling. 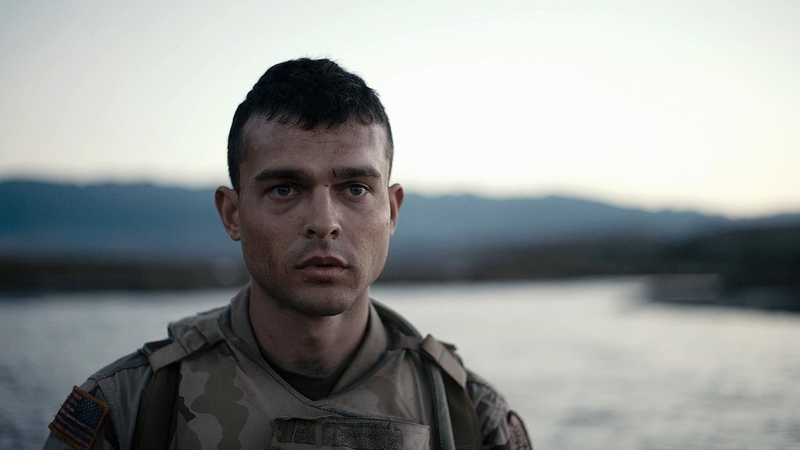 For a war movie unlike any other—except Best Picture Oscar winner Platoon—take the time to experience Alden Ehrenheich in Alexandre Moors’ stunning achievement.